While I haven’t posted any pictures in a while, rest assured that I have still been cooking. In fact, Tawn even got in on the act. 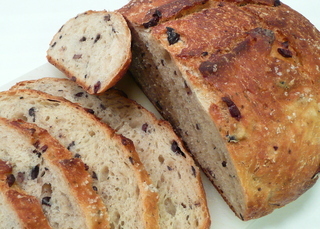 Below, top row: Kalmata olive and rosemary bread; Bottom row: Golden raisin bread. After returning from my Sunday morning bike ride (more about that soon), Tawn prepared a nice brunch from one of Ina Garten’s cookbooks. 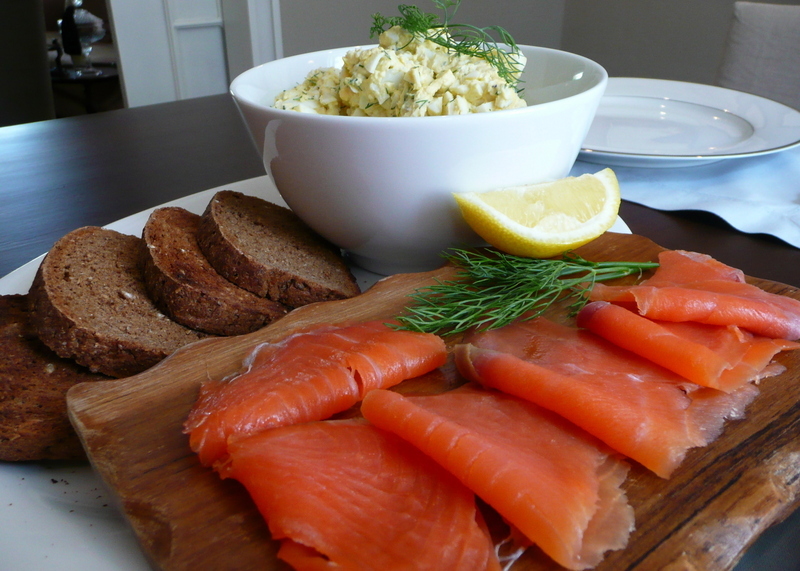 Tomato and feta cheese salad with cilantro and onion; and smoked salmon toasts with egg salad. Yummy, huh? It Thai, we say it is น่ากิน (nâa gin) literally, eat-able or “looks delicious”. Along the same lines, some other handy Thai adjectives include น่ารัก (nâa rak) literally, love-able or “cute”, and น่าเกลียด (nâa glìat) literally, hate-able or “ugly”. This entry was posted in Uncategorized and tagged baking, Bread, cooking, food by christao408. Bookmark the permalink. Very nice. The breads came out perfect. There’s a nice looking crust on the second one. 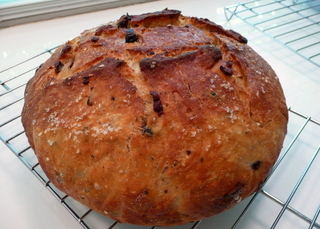 @amygwen – Yeah, that second loaf is really pretty. 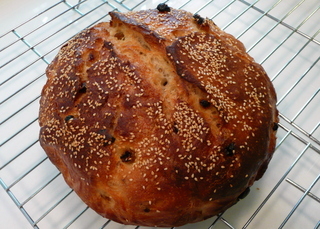 Sadly, the sesame seeds just fall right off when I attempt to cut the loaf. What a mess! @CurryPuffy – put pasathai gaeng mak! Impressive pictures and great post! I really like how you take pictures (vibrant, lively). I would say “GET IN MY BELLY……” yummmo pictures! @yang1815 – You’re fluent in cookie monster? @aromes – I try to be as vibrant as lively as I can when taking pictures. =)@XXKimPossibleXX – Nice Mike Myers impression. @TheLatinObserver – I’ve evaluated this and realize that in both time, effort and money, buying locally-baked loaves would be a better value. But I absolutely love making bread and the smell of fresh-baked bread is wonderful. @christao408 – Learning it with Rosetta Stone! Ooo, that salad looks amazing! Yum! wow, that looks really good. i still haven’t quite got the knack of making yeast breads yet… i need to find the time to practice more! Mmmm…. very nice. You folks should try opening a bed and breakfast. $250 USD a night sounds like a good starting rate. @epiginoskete – Very good on the Thai! @TheCheshireGrins – Thanks, I’ll let Tawn know you liked it. 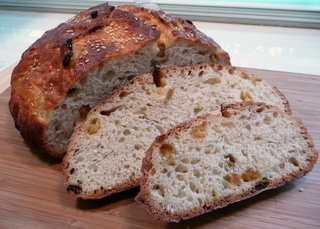 @kunhuo42 – There is an excellent book, “Kneadlessly Simply”, that you should check out. The theory is that instead of spending all the time kneading bread and letting it rise over a relatively short time, you just stir the dough together, regrigerate it for several hours, then do a long initial rise (8-12+ hours) followed by a shorter final rise. Since there is no kneading, it takes a lot of the work out of the bread. I’d be happy to happy out a recipe or two for you to try. @ElusiveWords – We thought about the B&B idea when we moved here. Boutique hotels were not on the scene yet, so there was a market. From what friends who have been in the B&B business have told me, it is a ton of work. Gee… I just noticed the biblical reference in your title. @christao408 – The beautiful thing about this Internet is that I don’t have to worry so much about mispronouncing. Awe what a nice husband to have food read for you after your workout. I drooled at the site of the salad. The breads! Dang Chris, Why are you so far away from me? YUMMMMERSSSS!!!!!! :9 :9 OMG, I wish I had someone (like you) who’d cook for me every day!! @ElusiveWords – Good catch, Matt! @brooklyn2028 – I miss your posts about baking, Sheldon. Hope you get wrapped up with school and have more time in the kitchen soon! @epiginoskete – That’s a good point! =D@stebow – Kind of a reversal of our usual roles…@ZSA_MD – Good question, Zakiah. You are planning on stopping by here on your next trip to India, right? I’m just perfecting things beforehand. @smirnoffinthesky – You just need to start cooking for yourself until you find that person. =)@murisopsis – We’re so about garnish in this household, Val, it verges on the silly. @stixandstonz – C’mon over to Thailand for a visit! @christao408 – Or I’d hire one ;D LOL. Wooow the foods look good. Can’t wait till love of siam out in DVD in US Oct 13. Is it good ? I was just about to ask who baked those delicious and tempting breads…too professionally baked with skillful hands..until I read the comments…well done.. hope to taste your breads when one day I am in BKK. Have a great day to you and Tawn. @vsan79 – In the grand scale of film-making, it is a good but not great film. What makes it a stand-out is that it is very unique among Thai films: a sympathetic, non-stereotypical portrayal of teenage boys sorting out their feelings for each other. There’s a good soundtrack, some nicely-composed shots of wintertime in Bangkok, and a sweet storyline. I have a Taiwanese copy (the only other one with English subtitles and the director’s cut) but will probably get the US version, too. That, however, is not the nearly 4-hour director’s version. @susanloo2002 – When are you coming for a visit? Wow. What a fancy looking lunch! Our lunches consist of a noodle soup we make at home or whatever leftovers we have. Looks delish! @swcheng15 – Homemade noodle soup sounds tasty! @ZenPaper – Any time, Evan. Any time. Hi 🙂 I’m Cyn; a friend of Zakiah’s. The photos are wonderful. 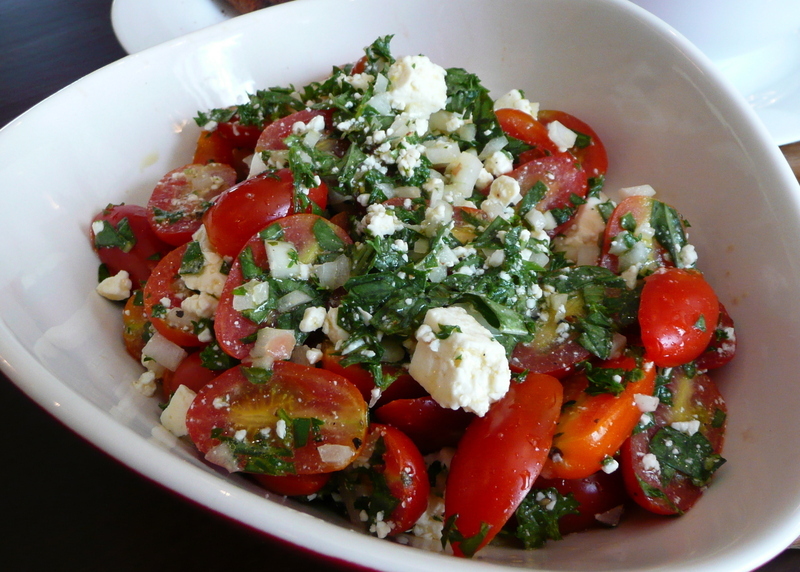 I wish I could reach into the screen and take a slice of that bread and a bowl of the tomato and feta salad, lol.